Supplier & Distributor of Food handling Conveyors. Our product range also comprises of Coal Handling Plant and Roller Conveyor. We manufacture and export Food Handling Conveyor using supreme quality material extensively used in pharmaceutical and food industry. 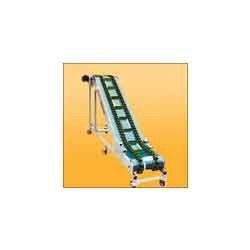 These food conveyors are available in various widths, length, speed to meet the exact requirements of our esteemed clients, and can be customized as per the client's given specifications. These products clients can avail from us at affordable price.